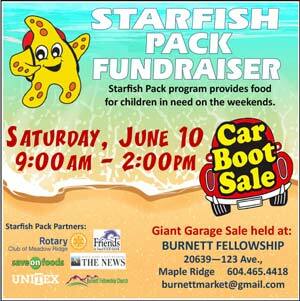 Burnett Fellowship is having their 2nd Annual Car Boot Sale and this year we are raising money for the amazing Starfish Pack program being run in our community of Maple Ridge. If you would like to be one of our car boot vendors (limited space available) please email burnettmarket@gmail.com or call the church office at 604.465.4418. There will be lots of food available including a pancake breakfast and BBQ lunch as well as a bake sale.